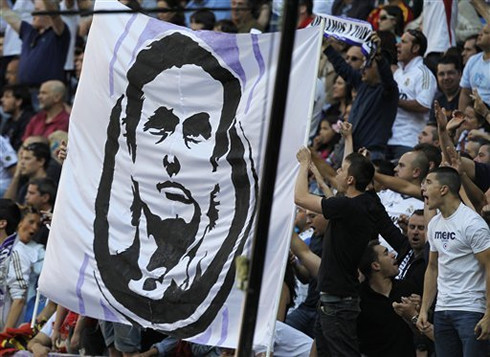 Real Madrid made sure to end the season with a comfortable 4-2 home victory against Osasuna, in a game where most of the focus has always been given to José Mourinho's goodbye. Cristiano Ronaldo wasn't called up for this match, as he appears to still be struggling from some minor physical problems. Higuaín, Essien, Benzema and Callejón scored the goals for José Mourinho's side. The last Spanish League fixture in Real Madrid schedule was played this Sunday afternoon and even though there wasn't much at stake at the Santiago Bernabéu, the Merengues defeated Osasuna in a clear 4-2 win. With Cristiano Ronaldo sidelined due to a back injury problem and several other rotations being done in the usual line-up, the Merengues struggled a bit to impose their law against the visiting side, but would manage to come out with the 3 points, thanks to goals from Gonzalo Higuaín, Michael Essien, Karim Benzema and José Callejón. 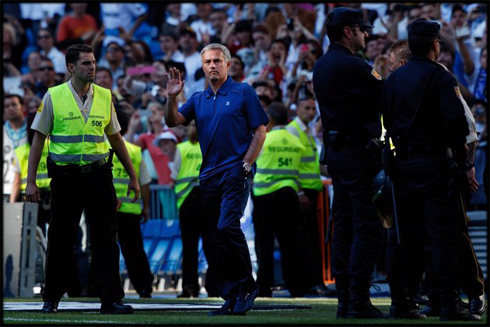 This has been José Mourinho's last game for Real Madrid as a coach and according to many online sportsbook websites, the "Special One" is now highly likely to be returning to Chelsea FC and become their new manager in the upcoming season. Osasuna came in to the Santiago Bernabéu knowing that there was no danger of being relegated anymore, a fact that has understandably allowed them to play their game without any kind of an additional pressure. However, the opening goal was meant to be scored by the Merengues and it was Gonzalo Higuaín who made sure the home side took off in the lead. There still neded 35 minutes, but a nice back heel pass from Angel Di María ended up putting his fellow countryman with a 1-on-1 situation against Osasuna's goalkeeper. Pipita would then simply do what he does best and finished it off with class. The second would follow just instants later, after a corner-kick got taken from Mesut Ozil on the left attacking side. The German's cross met Michael Essien and a nice heading gesture from the Ghana international buried the second goal for the Merengues in the afternoon. The former Olympique Lyon and Chelsea FC midfielder made sure to go celebrate this goal with José Mourinho on Real Madrid bench, which immediately triggered split reactions from the crowd watching the game in the Santiago Bernabéu. 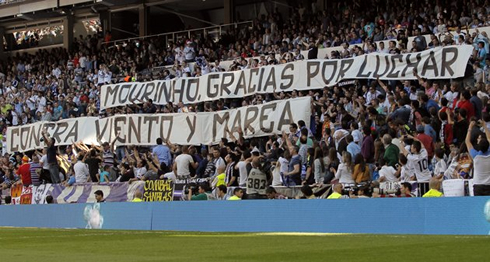 A good part of the fans insisted on whistling and booing José Mourinho everytime they were given a chance for that, while others preferred to show their appreciation for what the Portuguese manager has done for the club over the past 3 seasons. The second-half had a bunch of goals reserved for the fans, but surprisingly, Osasuna were the ones getting the first two. 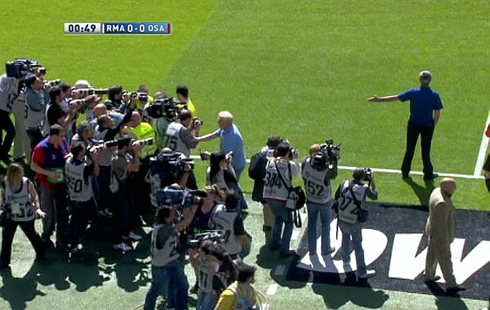 Ahead of the match a huge favoritism was given to Real Madrid. However and for a few moments during the second-half, it seemed like all of those who had invested money on the Merengues through the bodog betting market could actually be at risk of losing it. The first worrying signs came on when Roberto Torres got past a Real Madrid defender still outside the penalty area, cutted inside and fired away a strong shot aiming at the far post. Real Madrid goalkeeper this Sunday afternoon was Jesús, but the Canterano had no chance at all to stop the shot and simply threw himself to the left, as he helplessly followed the ball going in. The equalizer came in around the 63th minute, but this time, Real Madrid's defence left the impression that they could have done a lot better. Osasuna's attack on the left side resulted on a cross to the near post, which would then be deflected behind, so that Cejudo could respond with a flawless header. 2-2 on the board and Real Madrid was clearly denoting the lack of several key players in their defense, as it was the case of Fábio Coentrão, Marcelo, Pepe, Sergio Ramos or Varane, who were all ruled out for this last La Liga fixture. Nevertheless, the Merengues found a quick way get back into the lead inside the last 20 minutes of the game, after a great combination between Mesut Ozil and Karim Benzema. The German playmaker and the French striker exchanged a few passes as they slalomed between several Osasuna opponents, just until Benzema found enough space to strike the ball with his right foot, already inside the penalty-area. Riesgo still managed to put his hands on the ball, but the shot was just too strong to be blocked efficiently and home side were in front once more. The last Real Madrid goal of the season came off from a nicely built counter-attack play, finished by José Maria Callejón. It all started on a brilliant run by Gonzalo Higuaín, who picked up the ball still deep inside his team's half, got disposed of an Osasuna opponent on a long sprint and then delivered a pass to Karim Benzema, already very near Osasuna's penalty area. The Frenchman took his time as he waited for Callejón to go around around him and passed him the ball just in the right time so that the former Espanyol player had a chance to shoot. Callejón didn't think twice and with a strong strike he beat Ricardo and made it 4-2 for Real Madrid. With this victory, the Merengues also assured that they would finish the season undefeated at the Bernabéu, which also means that betting on sports from a Madridista perspective might have paid off afterall. 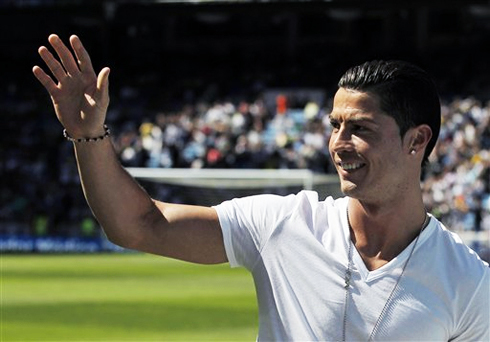 Cristiano Ronaldo next game will be for Portugal, against Russia, for the Brazil's FIFA World Cup 2014 qualifiers, on June 7, 2013. You can watch Juventus live stream, Portugal vs Russia, Spain vs Northern Ireland, Brazil vs England and USA vs Germany, all matches provided from our football streamings section.